I love the analogy of building a wall when it comes to how we should build our fitness, don't you? If you're going to age gracefully and remain durable as you prepare for your races this coming season, you'd be smart to remember that you need to build your own "athletic" foundation, similar to your home's foundation. Think about it...if you're driving down the road and you see a house that is leaning off to the side with a crumbling foundation, you sure wouldn't want to buy that house, would you? Even though you and I would desperately LIKE to be able to, we can't build true ironman, marathon, or ultra-running fitness by just saying it, OR by taking it ALL in one bite. Just as Will said, we need to start by laying that brick, one at a time, as perfectly as we can, day after day after day. If we do it right, soon we'll have that great foundation - one that is stable and straight and strong and that will support OUR "house" in any kind of wind, or more specifically, as the weeks, months, and miles add up! Establishing a solid foundation that will support all the training that is to come. At Pursuit Athletic Performance, we call this first training phase, Restoration and Foundation. During this time period, it's about learning as much as you can about your body - it's about self-discovery, from a movement point of view - learning your "story" as an athlete. That might sound a little strange but as a coach, I can't express just how important it is. Where do you feel tight? Why? Where do you feel weak? Why? Are you routinely fighting some kind of virus? If so, why? Do you struggle frequently with constant nagging pain or injuries? If so, why? Are you a strong, fatigue-resistant swimmer or a weak, slow swimmer? If you're a weaker swimmer, why? Are you a strong cyclist who can climb with ease, or do you struggle to push a larger gear? If you struggle to push that larger gear, why? Are you a strong, durable runner or would you consider yourself injury prone? If you're not durable, then why? When you get tired out on the race course or during long training sessions, do you struggle to maintain efficient form? Now if your house is about to blow over in the wind, or if that foundation is crumbling and starting to show some cracks...well then, the color of your window shades doesn't matter very much, ya know? Your body and your fitness are the exact same thing. Get started NOW. Answer the questions and take action, and you'll be on your way to building the biggest, baddest, greatest, fitness "wall" that has ever been built! It won't happen any other way. As always, if you have questions, leave a comment of email me directly and let me know. I'm here to help. Hi Everyone...Coach Al here. I've got an important message for you today, one that is hopeful and empowering and will help you be happier and better in 2017 and beyond! Mr. Clear has developed quite a following online because of his often profound and always concise writing. He wrote an article recently entitled "You're Not Good Enough To Be Disappointed." The article resonated with me and with many others, including some colleagues in the coaching community and some smart introspective athletes I coach. If you missed it, click on the image to the left and read it. I get frustrated, but that's just me. The article from Mr. Clear reminded me that one of the things that has always frustrated me, whether it was teaching percussion privately back in the day, or today as a coach, is how quickly people get impatient or discouraged whenever something is "hard" for them, or when they don't get instant results from a little bit of training or work. I'm also frustrated whenever athletes want to brush over the learning process (essential to improvement and growth, and for me, FUN), so that that they can get to the "really" good stuff, whatever that is. Now if that sounds harsh or hits home and makes you a bit uncomfortable to read, then you have a choice. You can close the page and check out for now, or you can keep reading and see if there's something here that's worth thinking about. I hope you keep reading. Now listen, this ISN'T about me, it's about you. I'm here to help you get better. I ran my first Boston marathon in 1983 as an unofficial runner (aka "back of the packer"), finishing in around 4-hours. The picture you see is from that day, hanging out with some friends right before the start. What an amazing day it was! I finished, absolutely IN LOVE with running AND with the Boston Marathon. I wanted to come back as a qualified runner, not one that jumped in the back and ran as a scab. So, I made a huge decision that day, vowing NOT to run another marathon until I was ready to run fast enough to qualify. (No small feat since the men's open qualifying time then was 2:50!). Injuries, miles, a lot of reading and study and research, more injuries, and dozens of road races and track sessions later, the time arrived when I believed I was ready to give qualifying a shot. I signed up for the Marine Corp Marathon as my first "official" marathon. Luckily for me, the qualifying standard had been lowered from 2:50 to 3 hours! My 3:01:20 that day in 1987, starting behind 11,000 runners, got me in. So let me ask, would you or any of your friends take four years, F-O-U-R years... to train and improve, between their first and second marathons? (Many runners and triathletes are so anxious and impatient, they sign up for their second marathon (or ironman) before the ink is dry on the finisher certificate from the first, without considering what it really will take to improve!). FIVE YEARS - 22 minutes. I will admit that when it came to training, my entire focus as a runner was on one thing: How I could run the marathon faster, and the Boston Marathon in particular. So it was more racing, more injuries, more humbling mistakes and "learning" opportunities. Hell, the things I write about and share today with the athletes I work with, I learned the hard way over those years and the ones that followed. I trained for 5 years before running the 2:39 at Boston in 1992 that stands today as my PR for the distance. 5 years to improve by 22 minutes. Have you or any of your friends worked relentlessly for 5 straight years, with a laser beam focus on one race, one distance? I have no more talent than you do, but as soon as I crossed the line in Boston in 1983, I knew what I wanted - I LOVED training with a very specific goal. And I LOVE the process. I always have, and I'm sure it comes in part from my life as a musician. If you're going to reach your true potential, you have to be willing to listen, learn, and work really hard for as long as it takes. And you have to try to avoid being frustrated, mad, or disappointed. It's that simple. As James Clear (and Dan John) pointed out, the fact is, you haven't worked long enough to be disappointed, frustrated, or discouraged. It's time to embrace the process and enjoy the journey, my friends. Just keep learning and working hard. Every day's a new day. If I've become known for one thing more than any other, it's speaking the truth. No, I'm not always right, but I do care. And because of that, I'm always going to be straight with you and tell it as I see it. Like it or hate it, it's what you get from me. Now listen, I know that's not popular these days. People don't want to hear the truth, especially when it comes to building that fitness "wall" one brick at a time, or mastering the basics and fundamentals first. Folks want cheering and applause, pats on the back, smiles and rah-rah. Now that's all fine, don't get me wrong. When it's truly deserved, that is. When it's EARNED. I went to a National Strength and Conditioning Association coach's clinic last weekend. During a panel discussion, a presenter chimed in and said something that did NOT go over well with the group. I found it fascinating. The guy who spoke up is a successful trainer. He was talking about how he’s recently had to change the way he does things. He said he's been forced to cave-in to the wishes of many of his clients, taking them beyond what they're really ready for at any given point in time. His words: "More of them are now routinely scouring Youtube videos - if I don't give them what they want, they get bored and move on." All I can say to that is...wow. A benefit of having been a long time coach is recognizing trends that are typical for developing athletes, whether they are the novice, weekend warrior, or experienced pro. One of the most common things I see (is it human nature?) is the tendency to self-sabotage the potential for massive long-term improvement in order to reach short term gain. Whether you're nodding your head in agreement or not, if you're like most, you'll forsake that advice and just go swim, mile upon mile, grooving poor skills and trashing your shoulders in the process. And if you're like many others, when you finally do decide that your skills are subpar, you’ll be faced with the fact that you’ve now hard-wired that poor form to the point where change is nearly impossible to achieve. Want some other examples of how impatient athletes short circuit their potential for massive long term gains? Building running mileage with the primary goal being an impressive running log, without first identifying imbalances and weaknesses in the body and addressing them head-on. Signing up for long course races (70.3 or 140.6) without first developing a solid foundation of fundamental skills and experience at the shorter distances. Spending $5,000 or more on a state-of-the-art triathlon bike before even owning a road or mountain bike or possessing any basic bike handling skills. I know, I know..there are a lot of "reasons" why many athletes approach things this way. I've heard most of them. Some feel they need more confidence to just "complete" the distance. Some are fired up by their newfound enthusiasm for the sport, and think they can jump on the "fast track" to improvements in durability and speed. I think many take the easy way out by downplaying their own potential for improvement, or sell themselves very short when it comes to how good they can actually be. So let me ask you, do you REALLY know how good you can be? (Hint: NO, you don't). Whether you like it or not, the truth is that YOUR greatest possibilities are built upon a solid foundation, AND mastery of the basics and fundamentals. It takes a long time to truly get good, which is one reason why I encourage folks to really embrace the process and enjoy the journey. So who do you want to be? The athlete logging miles to get some additional "confidence,” or the one who is willing to pay their dues to achieve true, long term, massive gains in performance potential? PS: If you aren't one of our email friends, you're missing out. We share a lot of awesome discounts and training information, so sign up if you haven't. Click HERE and as a bonus, you'll get instant access to my 5 TIPS for upgrading your off season NOW! I hope your Tuesday has started off great! I sent out an note to our email friends last week that included a reference to a fun Will Smith video. In the email, I shared my SSQ and how important it is to review this past season before moving on to the upcoming season. If you missed that email, here's a link so you can read it in your browser. Check it out - it's VERY cool! That email got me thinking about something else Will said that I absolutely love, and that is central to my coaching philosophy. One reason I love it so much? It's one of those quotes that isn't just about training, it has as much value for life in general. It also reminds me of an analogy my partner, Dr. Strecker, refers to when discussing how we need to build our OWN "athletic" foundation. He says,"if you're driving down the road and you see a house that is leaning off to the side with a crumbling foundation, you sure wouldn't want to buy that house, would you? One big gust of wind and the house might blow right over." During this time period, it's about learning as much as you can about your body - it's about self-discovery, from a movement point of view - learning your "story" as an athlete. That might sound unattainable, but I can't express just how important it is! Where are you tight? Why? Where are you weak? Why? Are you often sick? If so, why? Do you struggle frequently with nagging pain or injuries? If so, why? Are you a strong, durable runner or are you injury prone? If you're not durable, then why? Now if your house is about to blow over in the wind, or if that foundation is crumbling and starting to show some cracks, the color of your window shades doesn't matter very much, ya know? 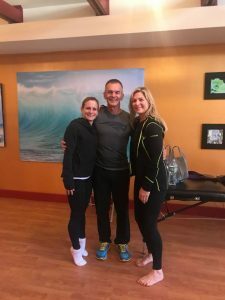 (One more thing, if you haven't yet checked out this blog series "Learn How You Move" we did a while back, take a look - it'll be worth your time, trust me). PSS: I almost forgot to mention, I just had two coaching slots open up for working with me one on one. If you're interested in learning more, reply to this email and I'll get you some information and a questionnaire. Rock on! Should You Take A Break? Shortly after the 2012 London Olympics, there was an article in the Wall Street Journal outlining how some elite marathoners were planning to take an extended complete break from any kind of training after the race. (A complete break...really?). In that article, one of the world's fastest runners, Bernard Lagat, was quoted as believing that "inactivity was one of the reasons for his success." He said he always "takes the time to be lazy." That doesn't sound like the kind of relentless intensity and focus we would expect from a world class runner, does it? Does Bernard know something we don't, or is the fact that he is an elite the reason he feels a break is justified? What is the right approach for the average age-group athlete who has a job and many other demanding responsibilities on top of training? My initial response when an athlete asks me if they should take a break is usually the same: It depends. Yes, I know that sounds like the classic "side-step," but honestly, there are a lot of factors that each of us need to consider as we decide how to approach this time of year. We really are all an experiment of one, and the consequences of our choices will have a huge impact on what's to come. Be honest: did you drill yourself into exhaustion or are you truly feeling good? Recovery and rejuvenation come in many forms and is different for each of us. Stress comes in many forms, too, and depending on our lifestyle, work, and training goals, it can take a huge toll. Some of that stress is good, and some of it isn't so good. The serious consequences of week-in, week-out, 3 (or 4) sport training for months on end, combined with busy, high stress lifestyles (and too little sleep) is a deep level of fatigue that for many borders on exhaustion, and in some cases, can paradoxically become addictive. Even though Bernard Lagat preferred a complete break, I've traditionally believed that for the majority, a simple change from the normal training routine can be a good approach. At the same time, as I've gotten older I'm reminded that there are few things as important as training consistency, especially as we age. Like many things training related, there's always many viewpoints. Is a "complete" break from training the best approach for short and long term mental and physical rejuvenation? If so, how "complete" is complete? Could a simpler primarily unstructured approach be best, where we just go "how we feel?" Is it better to turn to other activities that aren't typical for us in order to maintain some "fitness" while getting away from the sports we most often train in? If we take a break, do we risk losing hard-earned fitness gains that will be difficult to regain? If all else fails, trust your intuition. If your gut feeling is you "need" that break, you probably do! If you have been nursing an injury, STOP now and do what is needed to determine the root cause. NOW is the ideal time to resolve injuries once and for all. The harder and longer your races, the greater the likelihood you'll benefit from some extended recovery and rejuvenation. The older you are, the smaller the margin of error you may have for taking complete time off. To put it another way, as we age, we need more than ever to keep moving. Don't "stop" and rest just for the sake of it. The best "break" may simply be a change in training routine. For example, if you are usually on your tri-bike, put that away and get on your mountain bike or cruiser instead. If you're usually running on the roads, get off road and onto a trail. Ease off on the pace and re-establish your aerobic base at a conversational training intensity. If in doubt, try a relaxing hike, ski, roller-blade, or simply sleep in! If you're like many and could use to improve skills in some areas, now might be the perfect time. Lower intensity, and technique focused! Whether YOU need a complete break from structured training or not depends upon you - how healthy and durable you are, what you've done over the recent past, and what your upcoming goals are. Planning regular periods for recovery throughout the year is arguably more important, especially as one training phase builds to the next. Whether you're an elite (like Bernard), a weekend warrior, or a competitive age-grouper, if you've recently established some training consistency and feel mentally energized and motivated, AND you aren't carrying deep fatigue from a long season of racing and training, there is absolutely no reason to stop now simply because of the calender. PS: In a series of future posts, I'm going to lay out my philosophy for how to build fitness progressively in the off season. Stay tuned. Is STRAVA The Newest Coaching Tool? As she and I discussed whether she should follow through with her plans to run the marathon, which incidently was only a few weeks away, I decided that reviewing the plan she had been following would give me a sense of her preparation, so I asked her to forward it to me. As I looked the plan over, I instantly recognized what I believe is the most serious and common flaw of many marathon training plans. I have to admit I wasn't that surprised to see it - I've seen it over and over again in many different plans written by many different coaches. What is that flaw? Simply put, it is completing that last long run too close to race day. When I brought up the topic of this all-too-common mistake, she replied: "...all I have to say is, it's really incredible how hard it is to undo mass perception like that! To be honest, while it makes complete sense, I had never heard that before! The proliferation of social media and Strava in particular, gave me some insight into how some of my friends train who also race, and they certainly haven't applied this approach." I thought to myself, WOW...have we reached a point where Strava, is now not only a place to race for an "FKT" or fastest known time, but is now also a coaching tool? Are you an athlete who decides how you should train by watching what others do (often total strangers) and apply what you see them do, to your training? Do you assume that because someone might be faster, you should train like them? Do you believe that there is a "one size fits all" when it comes to training? It seems to me that with the popularity of Strava (and other social media), the inclination for some to follow others or see what they do and use that as coaching guidance, without really understanding how that might be helping OR hurting, is an ever increasing problem. Who knows why others are doing what they're doing, or whether THEY might go even FASTER if they employed a different approach? If you've shown up on race day with tired legs and performed below your potential as a result, give this topic some serious consideration. Resist the temptation to blindly trust the plan or the "expert" giving you advice. For a much more in-depth review of what I believe is the best overall approach for tapering into your marathon or iron distance triathlon, check out this blog post I wrote prior to last year's Boston Marathon entitled "Old Habits Die Hard."